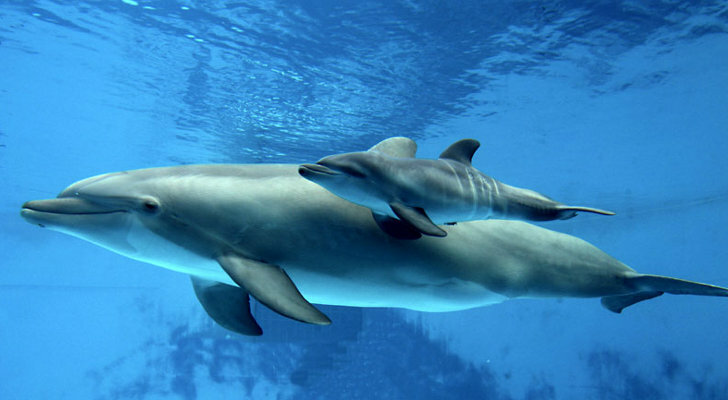 Bottlenose Dolphin ; At low tide, when the banks are exposed in the southern coastal states like South Carolina, the bottlenose dolphins head upriver, despite the risk of getting stuck in the murky waterways, to go hunting for fish. They devise an extraordinary plan, working in teams to sweep the fish toward the bank creating a bow wave to wash the fish onto the mud bank. Then, the dolphins throw themselves onto the bank and grab the flapping fish. This is a carefully orchestrated operation; they land on their right sides on the bank, coordinating with one another to avoid colliding. This extreme fishing technique passed down from generation to generation is a remarkable testament to their teamwork and intelligence.